Community Engagement is an important component for the Electric Vehicle Association of Alberta. Most members of the public do not have first-hand experiences with electric cars and part of our mission is to introduce them to this exciting and rapidly developing technology. 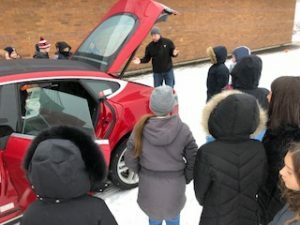 We have given in-class presentations and on-site electric car demos to school children, particularly those in grade 5. The grade 5 Alberta teaching curriculum has a topic that includes ‘Electricity and Magnetism & Mechanisms using Electricity’. This is a perfect fit to teach school children about what they are learning in class has real-world applications. Including the exciting advancement of electric cars. 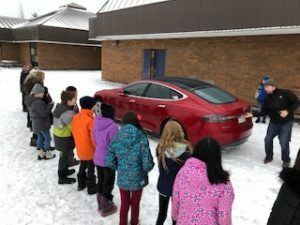 As part of our public outreach, please feel free to contact us to see if an electric car presentation can be held at your school or community event.